U.S. stocks finished lower on Friday, as investors failed to follow-through on Thursday’s outsized gains as nervousness about continued flattening of the Treasury yield curve overshadowed a stronger-than-forecast increase in housing starts. The spread between the 2- and 10-year Treasury yields reached their narrowest level in a decade, while housing starts surged 13.7% in October, hitting a one-year high. The S&P 500 and Dow Industrials both ended the week with slight losses, while the NASDAQ Composite edged higher. Retailers and smaller-sized companies’ shares jumped after reported strong third quarter earnings. Meanwhile, tax reform remained the primary focus last week after the House voted 227-205 to pass sweeping tax reform measures, while the Senate is debating its own plan. For the week, the S&P 500 and Dow Industrials both registered a second week of fractional losses, finishing with declines of -0.06% and -0.27% respectively. The MSCI EAFE (developed international) fell -0.59%. Real retail and food sales growth is a measure of the total year-over-year change in retail and food sales adjusted for inflation using the Consumer Price Index. By neutralizing the impact of inflation, the year-over-year change in retail and food sales provides a better view into the strength of consumer spending because growth in this figure indicates stronger demand without the impact of rising prices. Historically speaking, real retail and food sales typically decline heading into recessions, and therefore a weaker reading is a concern for the economy. 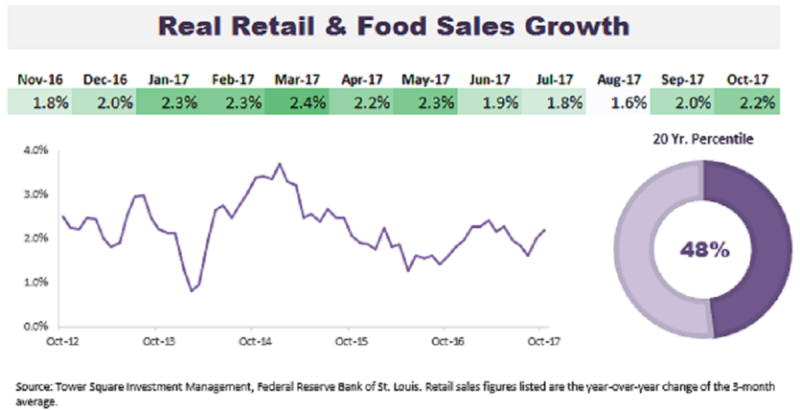 As Chart 1 illustrates, the three-month average of real retail and food sales in October grew by 2.2% over the past 12 months, which is a healthy reading, and a signal that consumer spending has accelerated in recent months. Overall, consumer spending has been healthy this year - the most recent sales growth figure is higher than we have seen 48% of time over the last 20 years, and is consistent with our view for continued economic expansion.